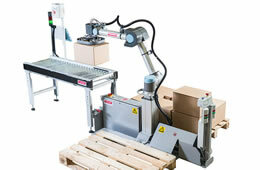 The machine contains one conveyor and one palletizer with two pallet positions. It is a single pick unit, working at 8 boxes per minute, with a maximum load of 8 kg each. Delivery includes the option to be powered by both 110V and 230V. Built-in vacuum pump, which allows an effortless move of the palletizing cell – no external air supply is needed. You can quickly design a palletizing unit with the FlexLink Design Tool and get a preliminary validation of the capacity with the built-in simulation. This tool is also used to design conveyors and complete production lines. The unit is easy to integrate with the line design thanks to the drag and drop functionality. The Compact spiral elevator allows you to maximize your production space, elevating and lowering products up to 2.3 meters over the floor. It can transport a wide variety of products and carriers, from individual parcels to pucks and cartons. 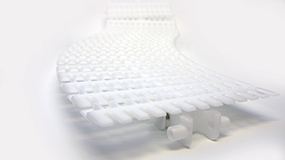 It features a friction top-chain and an ultra-resistant slide rail with low friction. 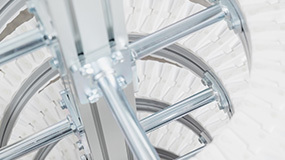 The Compact spiral elevator ensures gentle product handling with a continuous, and smooth, elevated production flow. The standardized solution has a low operating cost and a high meantime between failures. With its small footprint of 585 mm in diameter, the standardized spiral gives you a seamless integration to an existing production line. By also using the FlexLink Design Tool you can easily add it into your existing or entirely new layout. The spiral comes in a variety of configurations of both in- and outfeeds, making it adaptable to your line design. This standardized FlexLink product is a continuous solution, eliminating stop losses and can be installed within a few hours.